Sportspower Power Play Time Metal Swing Set Just $59! Down From $99! You are here: Home / Great Deals / Christmas Deals / Sportspower Power Play Time Metal Swing Set Just $59! Down From $99! Right now you can get this Sportspower Power Play Time Metal Swing Set for just $59 (Reg. $99) at Walmart! Add an element of fun to your outdoors with this Sportspower Metal Swing Set. The slim profile makes it ideal for smaller yards, allowing you to place it just about anywhere without it overwhelming the space. It’s also suitable for families with younger children who just want a basic starter set. 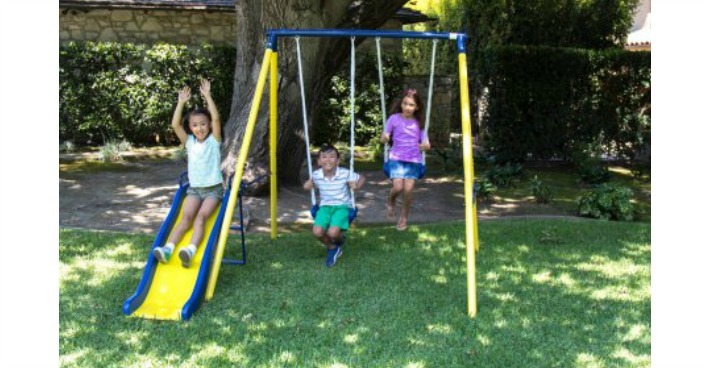 This backyard swing set is made of strong, non-corrosive metal in yellow and blue, offering seasons of outdoor enjoyment. It comes with two blow-molded swings that provide a secure seat for little ones and features an awesome 5′ two-tone wavy slide that has only two steps to climb. This Sportspower Metal Swing Set can accommodate up to three children. It gives them a way to release their energy in a safe environment.